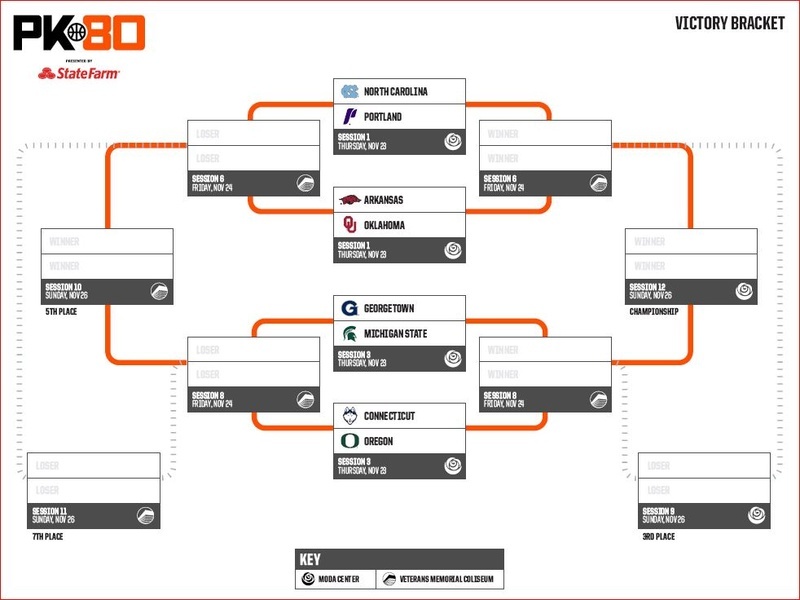 Although the brackets have not yet been announced, the two 8 team events will run simultaneously in the Rose Quarter's Moda Center and Veterans Memorial Coliseum....all the games will be broadcast on the ESPN networks. DoubleDipper wrote: Although the brackets have not yet been announced, the two 8 team events will run simultaneously in the Rose Quarter's Moda Center and Veterans Memorial Coliseum....all the games will be broadcast on the ESPN networks. UP cannot play Gonzaga, and I personally don't want to see UP play PSU during the tournament, but beyond that, "bring 'em on!" Four games per day, 2 at each venue, but we're not allowed to leave one venue and return to that same venue during that session. Bummer! DD was correct, the brackets came out today. Pilots vs. UNC on Thanksgiving in the Moda Center... lets kick this tourney off with a bang!!! IMO, that's a great draw for UP....what player would not want to compete against the national champions and such a storied program? The problem for we fans will be the availability and the cost of the tickets to PK80. I understand the tournament committee is attempting to force the fan bases from all the schools to purchase full packages through the Moda Center box office. As you may recall, a "Full Package" will cost $645 per ticket (plus an additional $120 to park), and as games will be played simultaneously in Moda and Veterans Memorial, and as you are not allowed to return to a venue that you've left previously that day....it seems far less than a "full package." The games are grouped into sessions, so I would assume there is an ability to leave during the early session and then come back for the later session (assuming you have the entry ticket). They will likely clear out the facilities between sessions? PilotNut wrote: The games are grouped into sessions, so I would assume there is an ability to leave during the early session and then come back for the later session (assuming you have the entry ticket). They will likely clear out the facilities between sessions? Looks like individual sessions go on sale on June 9th. Given that the first game is on Thanksgiving, I can't see myself going to multiple sessions or even multiple games that day. I wonder if there is a flex ticket system for the 2nd and third round. Depending on whether your team wins or looses, you need a ticket for different sessions. I'm guessing that there will be a ton of corporate tickets that will end up in the hands of the secondary market. That might just be my plan at this point. Will it be worth it for me to make the Thanksgiving trip? It's a lot to spend on tickets but it's also a once in a lifetime event. Hopefully it goes better than the Kentucky game a few years back at the ROSE GARDEN. SouthCarolinaPilot wrote: Will it be worth it for me to make the Thanksgiving trip? It's a lot to spend on tickets but it's also a once in a lifetime event. Hopefully it goes better than the Kentucky game a few years back at the ROSE GARDEN. I went to the Thanksgiving tournament in Anaheim in 2009 and I can tell you that was well worth the trip. This tournament will be a meat grinder for our young team. I guess we will find out early if our recruits are as good as advertised. I wonder if Vegas will have odds for the Pilots to win their bracket? blacksheep wrote: I wonder if Vegas will have odds for the Pilots to win their bracket? Might not be too early for predictions based upon last year's performances by each of the teams in the Pilots' bracket. UP will likely lose to UNC before meeting either Oklahoma or Arkansas, but then there's a very good chance they'll play Georgetown and their new Coach, Patrick Ewing, on Sunday....a game the new Pilots should have a chance of winning. Considering the level of competition in the PK80, a win there could be just the right thing to jumpstart this new team to a winning season! Looks like our first game just got tougher (assuming he's eligible to play right away). Single session ticket presale is TOMORROW June 7 if you signed up to be notified through the PK80 site. Otherwise I think the single session general sale date is Friday, the 9th. dholcombe wrote: Single session ticket presale is TOMORROW June 7 if you signed up to be notified through the PK80 site. Otherwise I think the single session general sale date is Friday, the 9th. Buying the single session tickets from the Moda box office will be the best way to get the better seats, but we do not know what session the Pilots will play in on Sunday....it depends on if they win or lose on Friday. It is my understanding UP season ticket holders will have the opportunity to purchase an Upper Level package for $110 through UP that will include all three Pilots games. For those of us who are spoiled by sitting close to the action in the Chiles Center, the Upper Level in the Moda Center and Veterans Memorial Coliseum will seem a long distance from the court....I'm counting on there being a number of empty seats and a friendly staff that will allow us to move closer to the action once the game is underway. blacksheep wrote: Looks like our first game just got tougher (assuming he's eligible to play right away). I guess because of the magnitude of this situation that is not totally unique to the ACC, compliance folks from all over have been discussing this case between Pitt and UNC.....and the consensus seems to be Williams will be granted a waiver and will be eligible to play for UNC this coming season. Yeah, I'm not sure what to do. The last official communication I received was that they'll have a number of tickets available, probably enough for most, but possibly not all season ticket holders. That was quite some time ago. Good to hear details are solidifying. I imagine the organizers have a better idea of what all session and all session in a single arena sales look like now and what they'll have available to allocate to UP as a result. I imagine they've probably allocated it at this point as a block before the individual session sales start breaking up seats and details/logistics are being worked out. But what do I know? Remember that all those who buy the full pass will only be able to attend one venue at a time. That will leave a ton of tickets unused. Many of those tickets will fall into the hands of the secondary market. I plan on purchasing the first two sessions, since we know when we will be playing, then looking for a scalped ticket on Sunday. blacksheep wrote: I plan on purchasing the first two sessions, since we know when we will be playing, then looking for a scalped ticket on Sunday. The package is $115.00 per seat ($110.00 base price + $5.00 handling fee) and are located on the sideline of the 300 level in the Moda Center and the upper level in the Coliseum. This package will guarantee you a seat to all the sessions we are playing in (3 games for Portland and 3 other games in our sessions). Due to the limited number of tickets that we have available you will only be able to purchase equal number of PK80 packages to the number of season tickets that you have on your account." I was asked last night, "Are you planning to join the rest of the family for Thanksgiving?" It's still over 5 months away, and TV scheduling will play a part in the final decision, but it looks as if the early session games will be at noon and 2:30 (PST), and UP will play UNC in the noon game. No guarantees, but if you plan your dinner around a noon game and it changes, you can blame ESPN!! We'll be seeing Cam Johnson on Thanksgiving Day! @GoodmanESPN wrote: Cam Johnson told ESPN he has been released by Pittsburgh to play at UNC. Will play for the Tar Heels next season as grad transfer. DePaul is replacing Georgetown in our bracket. Might impact us and might not. I would guess that since Georgetown got themselves a new coach this year that they didn't want to play with a team that is, in all likelihood, not going to be up to Georgetown standards. SouthCarolinaPilot wrote: DePaul is replacing Georgetown in our bracket. Might impact us and might not. I would guess that since Georgetown got themselves a new coach this year that they didn't want to play with a team that is, in all likelihood, not going to be up to Georgetown standards. I thought the reason they replaced the coach was that they hadn't been playing to Georgetown standards. The odds were the Pilots would play the Hoyas at noon on Sunday, and beat them. Some considered Georgetown to be so bad they had to get out of PK80 to save the ESPN embarrassment. There is now a high probability UP will face DePaul on Sunday. The history of the two teams playing one another doesn't really matter this many years on, but I wouldn't be surprised if a UP win would be its first over the Blue Demons. 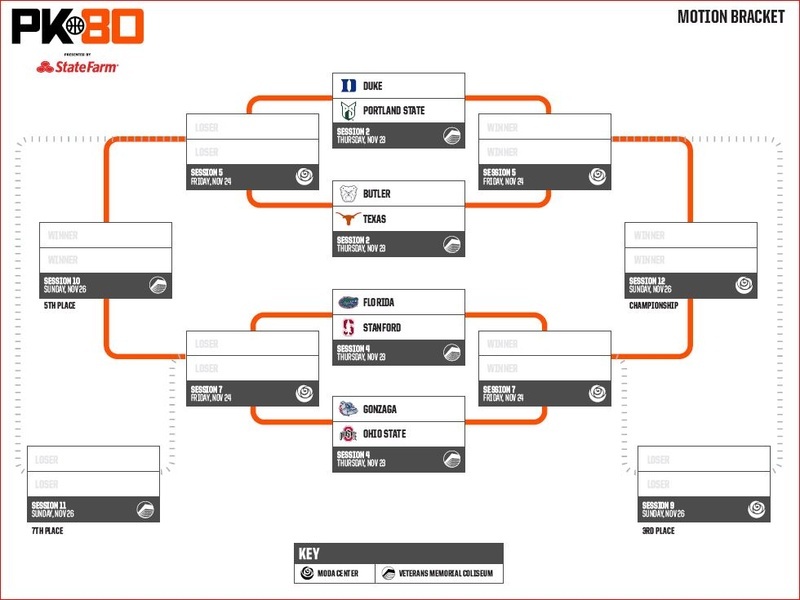 DePaul was supposed to play in the Wooden Legacy, but that tournament is not as prestigious this year (it does have SMC, however) as all the games will be played at CS Northridge instead of many of the games being played at the Anaheim/Honda Center. Sacramento St. has replaced DePaul in the Wooden Legacy....UP will play Sac State just before Christmas in Sacramento. Geez: StudentPilot said it more eloquently than I did. Georgetown definitely got a new coach since the team wasn't to their standard. But, I think it is safe to speculate that they backed out of the tournament to avoid a potential embarrassment in Ewing's first year. StudentPilot: A UP win would absolutely be our first over DePaul. Per our records, we are 0-5 against them, which includes the NCAA tournament loss. Sorry for geeking out and pulling up the information. I can't help it.